Providing precisely a centimetre of diameter, this offshoot of the 18×7 stainless steel rope range is well positioned to grab your attention thanks to its strength and durability. Read on to get the key information you need about 10mm 18×7 Stainless Steel Wire Rope and the add-ons we offer. Looking at the technical capabilities of any wire rope product is vital if you want to use it safely and with minimal risk of accidents. 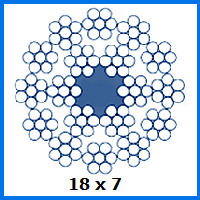 In the case of this 10mm diameter 18×7 construction rope, the main specifications are its 5,249kg load limit and 51.5kN breaking force. Digging down into the benefits of this stainless steel rope will also reveal that it will stay corrosion-free almost indefinitely, while also being able to reduce abrasions and fatigue thanks to its wire strand and bundle configuration. This type of rope is chosen for use in various industries, most notably for marine and sewage operations because of its imperviousness to the effects of moisture exposure. If an assembly made using this rope will not fit your circumstances, we produce plenty of other products to grab your attention. Fibre rope sits alongside the likes of galvanized steel rope on our site, giving you extensive options as you shop with Rope Services Direct. Get the aid you crave during any wire rope order by calling 01384 78004 or using our rapid response form to get a reply from one of the many experienced members of the RSD team. 10mm 18x7 Stainless Steel Wire Rope Overall rating: 5 out of 5 based on 6 reviews.